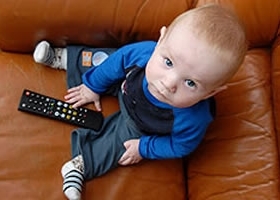 We all know that the American Academy of Pediatrics recommends no TV for children under two. But what about letting the TV play in the background, especially when your child seems to be paying little attention to it? Nope, your best bet is to keep it off. A study by researchers at the University of Massachusetts Amherst has shown that playing the TV in the background reduced young children’s ability to focus on playing and the amount of time they spent playing with a toy. It also reduced how many of the available toys they played with. Even though children were only watching the TV for a few seconds at time, the TV still had an impact on their behavior. So take that extra step for your children. Don’t just limit time watching TV; turn off the TV completely.